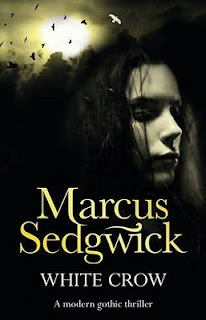 News: Marcus Sedgwick's White Crow to be made into a movie!!! Independent financier and production company Kerry, Kimmel and Pollack (KK&P) has secured the rights and will co-finance and co-produce the novel WHITE CROW, written by Marcus Sedgwick. The film will be produced and/or executive produced by Kami Garcia, NYT bestselling co-author of The Beautiful Creatures Series, Mark Morgan (The Twilight Saga), Michael Pollack (Quattrocento) & Brett Hudson (Cloud 9). WHITE CROW is a psychological thriller that centers on a 16 year-old girl who moves to a sleepy seaside town with a deadly past, and discovers what’s on the other side of death. KK&P plans to shoot the film in the fall of 2012 on Isle of Man, located within the British Isles. The author, Marcus Sedgwick, has been nominated for the Carnegie Medal, the Edgar Allan Poe, and the Guardian Children’s Book Prize. WHITE CROW marks Kami Garcia’s entrance into the world of film and television production. While some Young Adult and Adult authors are currently producing their own novels, Garcia is not only producing her upcoming solo novel Unbreakable: Book 1 in The Legion Series from Little, Brown (also with Mark Morgan and KK&P), but other film and television properties as well. News: Hunger Games to launch for the adult market in UK!! Competition: Finished copy of A Daughter of Smoke and Bone! Competition time folks! This time you can win a stunning hardback copy of Lani Taylor's new book, A Daughter of Smoke and Bone. It was published earlier this weekend has been the subject of some pretty huge and exciting buzz! I have, sitting on my bookcase at present, the lovely said copy of A Daughter of Smoke and Bone, and it is currently looking for a loving home! If you want to be in with a chance to win, all you have to do is fill out the form below, to make sure this copy is loved forever and ever! Isn't it perdy? Competition closes Friday 7th October, after which the winner will be announced! !